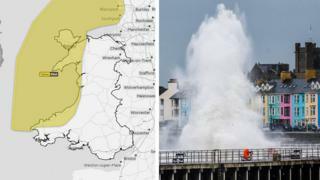 Hundreds of homes were left without power as strong winds and heavy rain hit Wales. Three yellow weather warnings were issued by the Met Office - one for wind and rain, one for snow and ice, and another for strong wind. Several roads were closed due to flooding and high winds, with fallen trees blocking some routes. The wind was expected to cause problems into Sunday, with the weather warning in effect until 02:00 GMT. Several hundred properties - mostly in Pembrokeshire - were affected by power outages on Saturday. Another major power cut, in Ystalyfera, Neath Port Talbot, saw more than 300 homes without electricity at one point. Scottish Power also reported cuts in Holywell, Flintshire, Newtown, Powys, and Caernarfon in Gwynedd. The wind, rain and ice also caused several problems on the roads. Motorists travelling on the A55 Britannia Bridge, between Anglesey and the mainland, and the Cleddau Bridge in Pembrokeshire were subject to speed restrictions and were both closed to high-sided vehicles. Other routes, including Cwmbach Road in Cadoxton, Neath, and the A4215 near Libanus, Powys, were blocked due to fallen trees. North Wales Police warned motorists about the threat of black ice around the Horseshoe Pass near Llangollen, Denbighshire. Some snow did fall across parts of north Wales, but a Met Office warning for snow on Sunday morning was lifted on Saturday night.